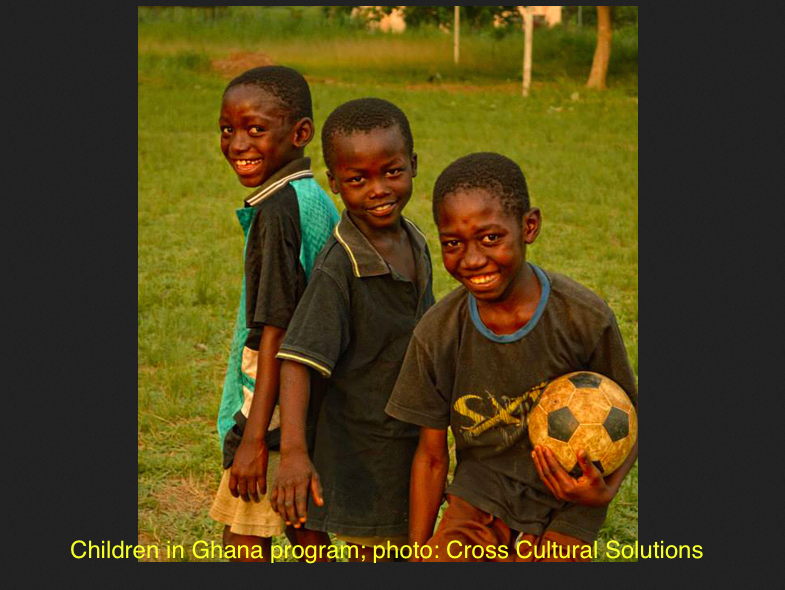 Volunteers play soccer with boys in Ghana on Cross Cultural Solutions trip. From community service such as building homes to volunteering for environmental projects, travelers are looking for ways to give back, and the trend known as voluntourism gives them a unique opportunity to do so. The concept of mixing volunteer activities with seeing the world dates back several centuries to the work of missionaries and took hold in the 1960s with the development of John F Kennedy’s Peace Corps. Programs focus on volunteering vacations, close to home or abroad, for the entire family to participate in. Local charities have always relied on volunteer help, but many now welcome short stay visitors to contribute a helping hand wherever they can. Tourists are welcome as groundskeepers and chauffeurs, for example, if they plan ahead with the Orlando charity, Give Kids The World. This short-stay residential village for children with life-threatening illnesses who have wished to see the themeparks, relies on many volunteers each week to meet their guests’ needs. The American Hiking Society (301/565-6704) runs cheap, week-long camping trips with small, friendly groups who are interested in trail-clearing and trail-blazing projects. Participants must be able to hike at least five miles per day and must be accompanied by a parent or guardian unless over 18-years of age. They’ve also begun a popular program of alternative spring breaks for small groups of college students. Elevate Destinations (800/605-0671) is a luxury adventure tour company whose trip to Haiti was selected as a National Geographic Traveler “Tours of a Lifetime.” Take your family on an adventure tour in Africa, Asia, Australia, New Zealand, Europe, South America, Central America, Mexico, Cuba or other fascinating destinations on an itinerary specifically tailored to fit your family’s interests, including local service. They regularly offer exciting volunteer trips, such as an African safari in Kenya where you can work with lion conservationists. Another Kenya adventure gives you the opportunity to work with tribal communities. Participants will learn about tribal skills, traditions and rituals. Since 1995, Cross-Cultural Solutions (914/632-0022), a non-profit organization that organizes volunteer abroad opportunities, has sent more than 35,000 people to volunteer in countries in Africa, Asia, Eastern Europe and Latin America. Participants have helped orphans, at-risk youth, adults and the elderly in programs that also promote cultural understanding among the volunteers. Programs in 11 sites in 9 countries last from 1 to 12 weeks. CCS offers programs for all ages and interests, including middle and high school students, families, senior citizens, working professionals, groups and people with disabilities. There are several program options for college students including international internships and gap year programs. Students can also work as a group, and CCS provides materials and resources for Group Leaders to promote group volunteering on-campus. Global Volunteers (800/487-1074) is a non-profit, non-sectarian, international organization based in St. Paul, Minnesota which has been running short-term human and economic development projects throughout the world for over 30 years. Having worked in 32 countries on six continents, they are currently offering projects in 17 countries. A spokesperson says they “have placed hundreds of families in meaningful, educational service projects in nearly all those countries,” including a grandmother and teen doing a two-month, three-country service journey together in Tanzania, China and India. Typical ongoing projects (many of which are open to families with children from under age 15 during school breaks and summer) include caring for infants and pre-schoolers, teaching conversational English, light construction and building maintenance, computer literacy, assisting with health care, and planting school and household gardens. “We’ve had more and more interest from families every year,” adding that they offer student and family discounts, and will help in fundraising for the trip if requested. GlobeAware.com (877/LUV-GLOBE) is another resource for teens as well as entire families, founded by Kimberly Haley Coleman, herself a mother of two toddlers. Designed for anyone interested in volunteering, it organizes and offers a variety of one-week international service vacations whose mission is to “encourage people to immerse themselves in a unique way of giving back.” Families can review upcoming service projects on the Globe Aware website, and get in touch with them to find out if they are appropriate for different age children. Ms. Coleman notes that many young families want their children volunteering at younger ages. Global Aware is committed to developing opportunities where even the very young can participate (such as helping to build a clay stove in a Latin village), and notes that foreign languages and cultures can be easily embraced by family volunteers. An operator of worthwhile tours called i-to-i (877/526-3959) organizes TEFL (teaching English as a foreign language) training opportunities for travelers. There are intern trips to a handful of fascinating locations such as China, Spain, Thailand and Cambodia. With over 35 years’ experience and the endorsement of National Geographic for their science research trips, Earthwatch (800/776-0188) is respected around the world. Their Teen Team Expeditions are hands-on trips that aren’t only educational, but a way for teens to make a real difference and help the places they visit. The organization offers all the tools, training, and experiences their volunteers need to make an impact. Activities range from snorkeling to tracking sea turtles in the Bahamas to monitoring climate change in Acadia National Park, Maine, to conserving wild bees in Costa Rica. Teen Teams are exclusive to 15- to 18-year-olds and run during the summer months. CCS High School Volunteer Abroad (914/632-0022) offers teens ages 15-17 trips to volunteer and serve international communities through global education, sports leadership and health projects. If you don’t want to volunteer with a group of adult family members, join a high school or community group of four or more members plus a chaperone. In the summer, teens ages 15 to 17 can participate independently in the Teen Volunteer Abroad program. The CCS in-country staff will chaperone independent teens in 1 to 4-week programs in Costa Rica, India, Morocco, Ghana, and Guatemala Teen Home-Bases. Parents can be reassured that these trips are supervised 24-hours per day, and include learning and cultural activities, field trips to local sites and engaging with local people. The U.K. based Projects Abroad has offered tailor-made group trips for more than 20 years, giving students, sports teams, or simply groups of friends a way to travel abroad to help others. They also offer two, three and four-week summer programs for 15 to 18-year-olds. Projects Abroad gives volunteers the option to custom-design a placement to suit their goals and interests. Groups can focus on teaching projects as well as conservation, archaeology, childcare, sports, law, veterinary medicine and animal care, human rights, and other subjects. Volunteering opportunities don’t have to come from exotic locales; often those in need are right in our own backyards. With that in mind, since our backyard is New York City, we decided to scour around for valuable work that students can do any time of year. Is your teen interested in “learning the ropes”? When the weather permits (generally mid-April until mid-November), the Hudson River Sloop Clearwater welcomes up to six volunteers for week-long overnight stints to sail along, assist and learn from the permanent crew. Participants must be at least 18-years-old. Since 1969, the Clearwater has offered environmental education and organized music festivals along the Hudson, while working towards the restoration and protection of the river. Once aboard, volunteers may get a taste of everything from boat maintenance and daily chores to sleeping below decks. Call 845/265-8080 for more information. Sailing experience is not a requirement, and this is a great way to learn. Habitat for Humanity offers teens the opportunity to help construct and rehabilitate homes in their communities, across the United States and abroad. Habitat for Humanity often has one-day volunteer opportunities as well as longer term projects. Junior Achievement of New York (212/949-5269) is a non-profit organization that bring volunteers together with students K-12, helping to inspire, encourage, and engage through in-class and after school activities in NYC, Long Island and the Lower Hudson Valley. These programs are designed to prepare students for their future plans and economic success -– “volunteers help students dream bigger dreams.” The program offers daily and weekend volunteer opportunities. Central Park Conservancy offers a handful of volunteer opportunities, from picking up trash to pulling weeds and painting rails. The Saturday Green Team meets every weekend from 10 am and 1 pm and performs a variety of functions crucial for maintaining the park’s beauty. Sign up one week before the date; space is limited. Participants must be at least 18 years of age. United Way of Northern New Jersey strives to bring the basics, education, income and health to everyone. Deliver food to elementary schools or help the program develop agendas and initiatives and gain important skills crucial for entering the workforce. Voluntourism has been good for the travel industry as a trip motivator. Surveys done by D.K.Shifflet estimate that about 2% of the general leisure travel population actively seeks out volunteer vacations, though we find interest among families for including at least one volunteer activity on their vacations to be much higher. Among the hotel and resort-based volunteer opportunities, most follow a mantra of sustainable tourism: “give back to the community.” The Ritz-Carlton chain offers organized “Give Back Getaways” at many of its properties. These programs, run in conjunction with local non-profits or charities, allow short stay guests to participate for half day projects focusing on child welfare, feeding the hunry, or preserving the environment. Sandals Resorts (who also owns Beaches Resorts) owns the Sandals Foundation to give back through community and educational programs and preservation projects. The Foundation has also built music rooms, sponsored CPR training for teachers and given out numerous scholarships. But volunteer opportunities on a local level abound, especially in hurricane torn regions. Discounted room rates apply for volun-tourists at many hotels; ask before making your reservation. Additionally, some travel agency sites such as Travelocity.com have special affiliations with sucha charitable groups as Travel For Good. We welcome you to share any others you find in the Comments field below. On June 4, 2011, American Hiking Societyâ€™s National Trails Day will bring together outdoor enthusiasts across the country for the 19th annual celebration of America's magnificent trail system and its countless supporters and volunteers. See http://www.AmericanHiking.org for details on one of the 2,000 events near you.